A two tier round wedding cake iced in soft buttercream frosting and decorated by our talented wedding florists with ivory and pale peach David Austin roses and champagne Sahara roses. Finished with a soft ivory organza ribbon around the base of each tier for an extra beautiful touch. Order online or by contacting us at enquiries@bridesinbloom.com.au. 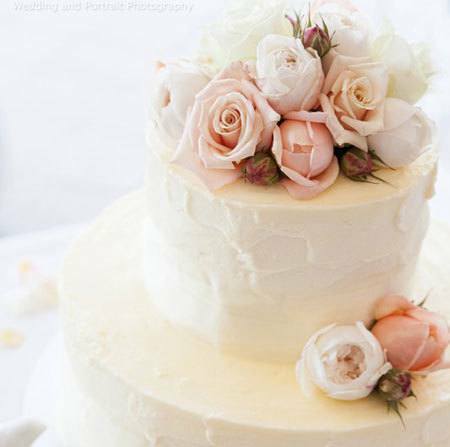 Alternatively click on this enquiry link for a fully customised wedding cake quote within 48 hours. Provides 75 coffee sized servings for wedding guests. Minimum order cut off seven working days prior to wedding. *David Austin roses are subject to seasonality and alternative, similar style roses will be used where required.